Moments before his first start with Class A Short Season Lowell, Jake Cosart was tired and nervous. It took no more than a second for him to shake off those feelings and go from sluggish to dominant. "I was expecting to be a little nervous, and I was," the Red Sox's No. 23 prospect said. "I was a little groggy and lethargic before the game and that was a little annoying. But then I got out there and saw that I was pitching in front of 2,000, 3,000 fans, and that really wakes you up quick." Cosart struck out three and walked three over four hitless innings Sunday as the unbeaten Spinners took the no-hitter into the eighth en route to a 5-0 blanking of Vermont at Centennial Field. The 2014 third-round Draft pick dominated the Lake Monsters by commanding his fastball, particularly to the inside part of the plate, something he said he picked up from rehabbing Triple-A pitcher Danny Rosenbaum. "Danny Rosenbaum said to me, 'Jake, someone with your stuff is going to be really successful if you can just establish the inside part of the plate on these hitters,'" Cosart said. "I didn't really have my curveball and I can spot it usually, but I had no feel for it at all. I mixed in a few changeups, but I was definitely able to rely on my fastball." The 21-year-old right-hander also has gotten advice from a closer source, older brother Jarred, who pitches for the Miami Marlins. "We talk all the time. 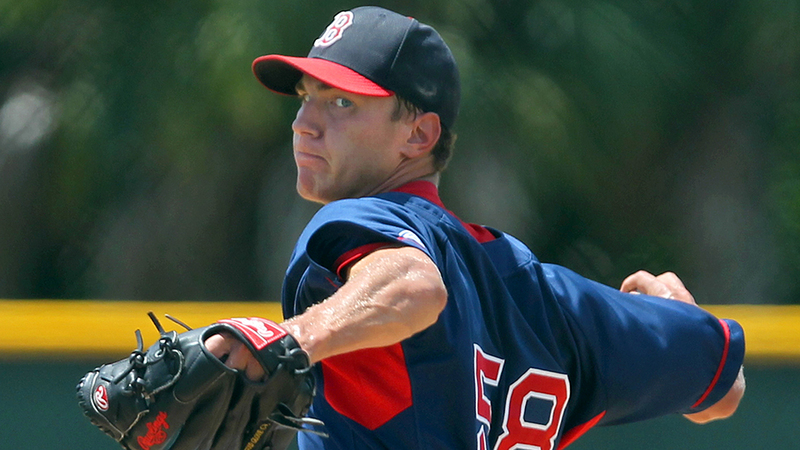 He's my go-to guy," Cosart said. "Obviously, it's a great asset to have a brother who has been an established Major Leaguer. He's taught me a lot and shared a lot of helpful stuff, and I'm seeing a lot of what he's taught me come into play out there." The Texas native transferred to Seminole State after spending his freshman season at Duke and pitched well enough to become the second junior college player selected in the 2014 draft. Cosart debuted in the Rookie-level Gulf Coast League last summer and went 0-1 with a 2.25 ERA over 16 innings in seven starts while holding opponents to a .132 average. The 6-foot-2, 175 pound righty's build and mid-90s fastball have drawn comparisons to Red Sox No. 12 prospect Michael Kopech, selected two rounds ahead of him. Although Cosart's control and secondary pitches are still raw, his athletic ability gives him a chance to develop into a solid power pitcher. He said his approach, mentally and physically, will be just as important. "I want to work on staying more focused," Cosart said. "I felt like in the fourth I got a little fatigued and that affected my focus a little bit. I'm realizing in my first year that it's a long season and it's a grind. "My No. 1 goal ultimately is to stay healthy. Being out there every day can go a long way toward getting me where I need to be." Taylor Nunez (1-0) relieved Cosart and kept the no-hitter going until the eighth, when Steven Pallares greeted Matt Kent with a leadoff single. It denied the Spinners the second no-hitter in franchise history and first since Jeff Farrell and Yulkin German combined on one on Aug. 13, 2006 in a 2-0 win over Hudson Valley. Zach Kapstein had two hits and two RBIs for Lowell, while Luis Alexander Basabe went 3-for-4 with a double and a run scored out of the ninth spot in the lineup. Vermont starter Kevin Ferreras (0-1) gave up four runs on six hits and a walk with four strikeouts over four innings.